In terms of longevity, Alfred Hitchcock Presents was the most successful American television anthology series. It ran from 1955 to 1962 in a half-hour format and then from 1962 to 1965 as The Alfred Hitchcock Hour. The list below includes only the 268 half-hour episodes. 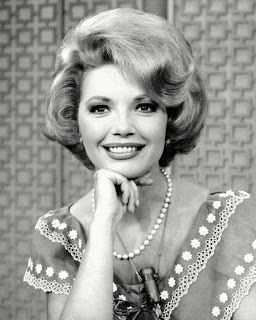 Barbara Bel Geddes looking calm. 1. 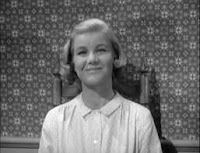 Lamb to the Slaughter - When a meek housewife (Barbara Bel Geddes) learns that her cheating husband is leaving her, she whacks him--fatally--with a frozen leg of lamb. She then calmly calls the police to report that her husband was murdered by an intruder. This darkly amusing tale, written by Roald Dahl, works to perfection--right down to the killer punch line. It was one of only 17 episodes (of the total 268) directed by Hitchcock. 2. Man from the South - Based on another Roald Dahl story, this episode stars Steve McQueen as a young man who bets a wealthy oddball (Peter Lorre) that he can light his lighter ten times in a row. If he can, he wins Lorre's snazzy convertible. But if the lighter fares to produce a flame just once, he loses a finger. A suspenseful, well-acted classic featuring another one of Dahl's trademark twists. 3. Revenge - The very first episode of Alfred Hitchcock Presents raised the bar very high. 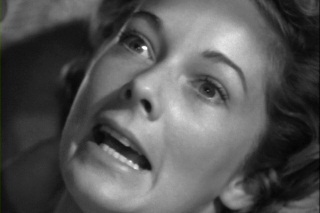 A distraught woman (Vera Miles) tells her husband she has been assaulted. When the police investigation goes nowhere, the couple seek their justice and go looking for the assailant. In a long-running series featuring a number of memorable twist endings, "Revenge" features perhaps the most potent one. Directed by Hitchcock. 4. The Glass Eye -Director Robert Stevens won an Emmy for this haunting tale of a middle-aged woman (Jessica Tandy) who falls in love from afar with a ventriloquist she has never met. After they begin exchanging letters, he agrees to meet her--with disastrous results. This beautifully written teleplay (by Stirling Silliphant) provided underused actor Tom Conway (George Sanders' brother) with his last good role. It's ultimately a very sad story of two lonely people. Billy Mumy with loaded gun. 5. Bang! 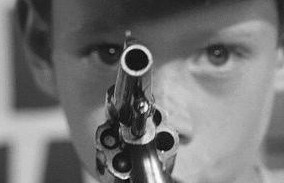 You're Dead - Hitchcock directed this wonderfully tense episode about a young boy (Billy Mumy) who mistakes a real gun for a toy pistol and spends the day playing with it. The worst part: the gun is loaded. Mumy's success as Will Robinson on Lost in Space has obscured his finest TV work, as in this episode and the "It's a Good Life" episode of The Twilight Zone. Honorable Mentions: One More Mile to Go (a man with a corpse in his car trunk) and Victim Four (a Paul Henreid-directed episode about a woman whose bad headaches are really bad). It's interesting to note that both Alfred Hitchcock Presents and The Twilight Zone featured adaptations of Ambrose Bierce's An Occurrence at Owl Creek Bridge. However, The Twilight Zone episode was actually a short French feature filmed two years before its broadcast on Twilight Zone. Great! When I opened the link I thought "I bet you the leg of lamb episode will be on here." I always really enjoyed the "Coo Coo Clock" one as well, which Patricia Hitchcock appears in. Really creeped me out as a 5th grader. Same hear. I knew it would be there because this is the one thing that every intelligent TV fan can agree on. We can fight on TOS V TNG, Mike V Joel, Bob V Newheart, but everyone you ask will put "Lamb to the Slaughter" somewhere on their list of Hitchcock, and even classic TV, episodes. Lamb to the Slaughter is definitely the best, with the best twist ending. Ralph Meeker was excellent in Revenge (especially the last close-up of his face when he realizes the truth...). I recall another AH episode Meeker did, in which he's a husband who's being poisoned by his wife - it also had a great sly, twist ending. That Peter Lorre one with the finger got me as a kid. I shuddered reliving it here as I read the list! I vaguely remember the one with Barbara Bel Geddes, anxious to see it now for the ending. I love a good twist and this show certainly had them! Rick, again you set yourself a daunting task to pick just five episodes. I've seen a fair number of episodes, but nowhere near all. One I do recall that made a strong impression on me is about a boy who orders a home mushroom-growing kit from a comic book and installs it in his basement. It's almost a variation of "Invasion of the Body Snatchers" and more like a typical "Twilight Zone" episode than a typical "AHP" episode, which is probably why I recall it so well. One interesting thing is how often actors who had worked or were to work in Hitchcock films--like Barbara Bel Geddes, Jessica Tandy, Henry Jones, and John Williams--were cast in the TV series. Rick, I would also include "Into Thin Air" from 1955 starring Patricia Hitchcock. A plot eerily similar to that of "So Long At The Fair" (1950), which I suspect had attained "urban myth" status by this point. I really liked the one where the intruder comes into this housewife's house when she's home alone and it turns out, at the very last second that she's actually blind. that one was awesome! I think "Lamb to the Slaughter" must have planted a little seed of doubt in the minds of generations of husbands regarding their loving spouses. Every time I go to the freezer the hubby mentions that episode, chuckles awkwardly and gives me a kiss. So far, he's lasted 24 years. Time will tell. Rick, this is an excellent selection of "Alfred Hitchcock Presents." "Revenge" is truly thought provoking and chilling; even the picture you posted of Vera Miles is quite disturbing. I am very fond of Roald Dahl's dark humor and Barbara Bel Geddes is marvelous in "Lamb to the Slaughter." "One More Mile to Go" is fascinating in that something so seemingly small could foil a clever plot. Well done! Rick, To be honest, the only Alfred Hitchcock Presents episode I distinctly remembered is "Lamb to the Slaughter." After reading your selections, though, I did recall "Man from the South" and "Bang! You're Dead." "Lamb to the Slaughter" has to be one of the greatest episodes of any mystery/suspense series ever. Excellent selections. Thanks for the comments and wonderful recommendations. I will be seeking out: "Coo Coo Clock," "Malice Domestic," "Man With a Problem," and "Into Thin Air." Toto, "One More Mile to Go" is a personal fave! - You didn't mention "Man From The South"'s director: Hitchcock's right-hand man/protege Norman Lloyd, who contributed mightily to the whole show. Nice catch. I should have said AHP was the longest-running anthology series on network television. I consider the HALLMARK HALL OF FAME a series of specials--not a continuous TV series. "The Perfect Crime" with Vincent Price has always been one of my favorites. There are a couple on your list I haven't seen, I'm gonna have to check 'em out! Not to nibble you to death duck-style, but even with the US networks, you have MASTERPIECE THEATRE, and even MYSTERY! before incorporation into MT, running weekly enough longer than AHP:...and AMERICAN PLAYHOUSE might qualify there, too (though that series wasn't quite weekly, most seasons). And STUDIO ONE had 10 slightly scrambled seasons on CBS-TV. But for US commercial networks with a more or less continuous play (even given the net jump and slight shift in title at the end), yes, Hitch's baby was the champeen. In the first season "Help Wanted" is the best! I found the list interesting and liked all the episodes. Personally I would rate "Premonition" as the best. Does anyone remember an old Alfred Hitchcock TV Show that was called "Jail" or "Prison"? It was about a future police state world where an innocent young man is arrested and is tried and convicted.The punishment is that he is to be aged 40 years and to do this he has his brain switched to the body of an old sick inmate and the old sick inmate gets his brain put in the young man's body.This brain switcheroo was accomplished by some kind of process where they sat side by side and had some kind of helmets attached to their heads and then this machine turned their into a smoke like vapor and switched their brains from one to another! I remember the episode but can find no trace of it on the internet...does anybody know of it? I've only seen the first two seasons but to me, None Are So Blind is easily the best episode so far. man with a problem. i never get tired of watching.easily the fastest plot twist!!! My personal favorite was Final Escape. Scared the hell out of me as a child. My favorite, which is almost never mentioned on these threads, is "The Little Man Who Was There". I have always enjoyed the show Alfred Hitchcock Presents. I used to watch on T.V. back in the 1960's when I was a kid in grade school, then again in the 80's on KOFY Channel 20 in San Francisco, and more recently Hulu has the first four seasons available for viewing pleasure, if you don't mind sitting through their commericals. Along with the Twighlight Zone, AHP was the best anthology series ever shown on T.V. It was not consistently good as what Rod Serling weekly delivered, but when Alfred Hitchcock Presents was in top form it was every bit as great. Here are a few memorable episodes that I have seen over the years and which were not mentioned by anyone. 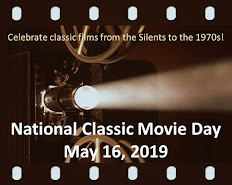 Starting with Breakdown (starring Joseph Cotton), And So Died Riabuchinska (starring Claude Reins and Charles Bronson), Crackpot, Mrs. Blanchard's Secret (which was directed by Alfred Hitchcock), Road Hog, Escape To Sonoita (Starring Burt Reynolds), Hitch Hike (Featuring a very young and beautiful Susan Pleshette), The Crooked Road (starring Walter Matthau), and lastly one that none else seems to think highly of except me, Don't Interupt (Featuring a young Cloris Leachman). There are plenty of others that I could name which are also deserving of being mentioned, but I'll let my list end with one more entitled Post Mortem so that others can name of few of their own favorites and thus add to what has already been presented. I beleive there were about 265 episodes of AHP, plus around 100 episodes of the Alfred Hitchcock Hour. I did not enjoy watching that show as much, although there were definitely a few good ones; such as The Open Window, The Jar, and The Magic Shop. Overall I'd give the AHP show ***** stars, and the AHH *** stars. Great Post. Great Selections. I would have chosen "One More Mile To Go" over "Bang You're Dead" however. I loved that episode and "Bang You're Dead" is just too predictible. I know a lot of people like it though, and it was remade in the revived AHP series of the 80's. Now if Billy Mumy had actually killed someone - well that would have been different. But I doubt that the censors back then would have allowed an ending as shocking as that! Dang my favs weren't mentioned. Into Thin Air, An Unlocked Window, Body in the Barn, Return of Verge Likens, The Cadaver, Low Clouds & Coastal Fog, and Never Again! Perhaps they were the hour long's. I think The Glass Eye is one of the most creepy ones. The ending is as close to horror is Hitchcock gets. What? No "The Lonely Place"? Bruce Dern and Pat Buttram were great in that episode.